Resisty – Resistor CAPTCHA – solve the resistor values to post a comment! « Adafruit Industries – Makers, hackers, artists, designers and engineers! We are thrilled to release a solve-the-resistor CAPTCHA plugin for WordPress! This plugin will draw a random 5% or 10% resistor and four color band sliders beneath it. 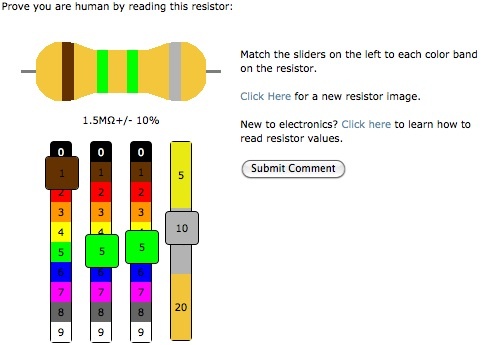 The commenter needs to match the colors on the sliders to the colors on the resistor. Commenters don’t actually need to know how to read resistors, but this will help them as they post comments on site that use this plugin. Random resistors are generated from E12 and E24 decade values (so there’s never something like a 4.6K Ohm resistor. Plugin created by: Adafruit Industries – Daigo Kawasaki, Limor Fried and Phillip Torrone. It’s open source, so please feel free to use it and improve upon it! Our goal is to teach a little about electronics as people participate online. We’ll see how it goes! You can try it out in the comments on our site right now! I am colorblind of red green. I will see if it works for me too. If I fail it proves I am a computer. Good day sir. This is the best thing ever! Well, the best thing I’ve seen in the past 10 minutes…. Love it. i just want to test this new comment thing move along, nothing to see here. what about color blind people? @cyrus – please read any of the comments or look at the source code. there’s a color blind option and also, people who are color blind have commented here as you can see. It would be super cool if there were other puzzles. Like an odd-one-out with, for example, two SMD components and one PTH, or two passives and a logic gate. This is amazing. Preventing spammers and helping people learn electronics at the same time. I need this for my dorkbot website! To all the comments about ‘bots solving it’, it is actually trivial to solve for a bot, don’t kid yourself that it isn’t. As for whether it would be worth their time, the question is self fulfilling. If this is shown to stop spam, more will use it, so it then becomes increasingly attractive to solve automatically, until it’s broken. I’d also point out that it’s not possible to use if you’re using a text reader and that it cannot be used on US governmental websites because it would violate disability grounds; it’s hard to use for someone who doesn’t have at least reasonable motor dexterity, and I’d also note that at least 10% of the US populace is considered to have a vision impairment. It’s not a bad idea, but over time it’s not entirely workable. Hmm, it would be trivial to circumvent this, how about getting a huge stack of photos of actual boards with components on them and ask people to identify value of “The resistor in the top-left corner” or “second from the right”. That would be *much* harder to crack.